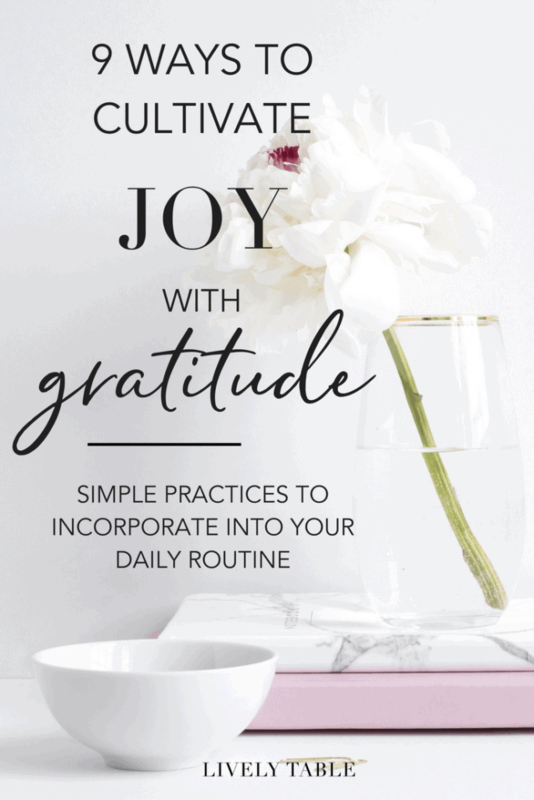 9 ways to cultivate joy with gratitude – simple practices you can use in your everyday routine. To learn to cultivate joy with gratitude, start with self acceptance. Side note: I stinking love Brené Brown and her approach because it’s scientific. In case you haven’t read any of her books, she is a researcher of vulnerability, courage, empathy, and shame. Since I’m from a scientific background, it’s harder for me to grasp what seem like abstract concepts like emotion, so I love her data-driven approach. Also she’s a Texan. So from the research, the way to cultivate a joyful life is to practice gratitude. Which can be harder than it sounds. We can’t just say, “Okay, I’m going to be more grateful.” It has to be more than a just change in attitude, but a shift in daily actions. We have to adopt tangible practices of gratitude. 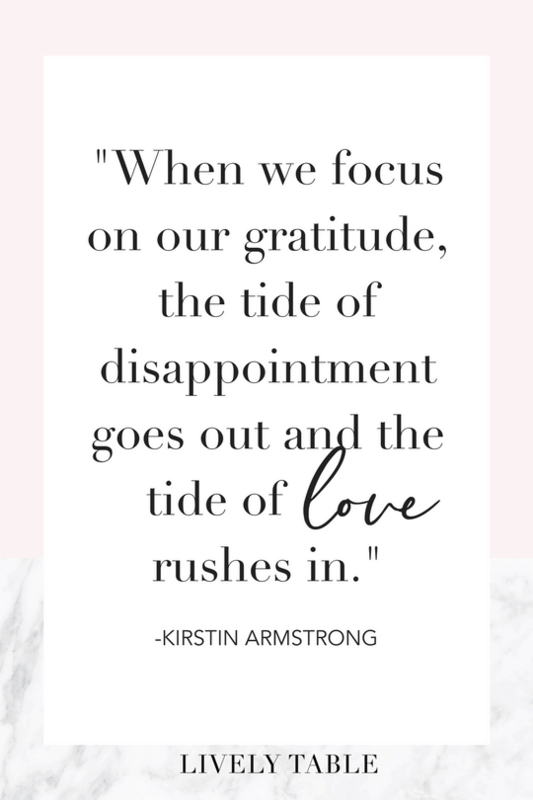 When we focus on the good, the things we do have, we are more open to receiving joy instead of immediately foreboding it with negative thoughts. And when we get in the practice of daily gratitude, we are more resilient when bad things happen, because they will. Here are 9 ways to cultivate joy with gratitude. One of the reasons we tend to lean away from joy instead of leaning into it is that we struggle with our worthiness. Do we deserve joy? The answer is yes. You are a human being and you are as worthy of feeling joy as any other being. (Remember that self-acceptance part I talked about?). Make it a daily practice to remind yourself that you are enough. Period. You can write it in on your bathroom mirror, or make it a reminder on your phone. But tell yourself daily that you are enough and you are worthy or joy. 2. Stop the comparison game. We can be happy for other people’s successes without belittling our own. Especially in the age of everyone’s perfectly edited lives being plastered on social media, it’s important to realize that we only see the highlight reel, or the best or other people’s daily lives, so it’s not fair to compare our everyday lives to that. Don’t compare your point A to somebody else’s point D. Instead, focus on your own successes where you are, rather than striving to be somebody else. What is one thing you have accomplished, big or small, that you are proud of? And if you need to, go through your social media feeds and unfollow anyone who makes you constantly compare yourself to others. Writing down what you are grateful for can help to remind you of all the blessings in your life that you may take for granted. Get a notebook or write it in your phone, and start to record what you are grateful for daily. You can start small with only one thing if that’s all you can think of. Eventually try to write 3 things you are grateful for every day. It helps to do it at the same time every day so that it becomes routine. Taking time to be in the moment instead of worrying about the future or past can help you become more mindful and be grateful for the little things. You can use a guided meditation app, practice yoga, or just take 5 minutes out of every day to sit in quiet and just breathe. 5. Write a thank you note. When was the last time you wrote somebody a thank you note? Telling people that we appreciate them doesn’t only make the person receiving the note feel good, it helps us to remember the joy that person brought us. 6. Find a gratitude partner. If you find yourself letting your gratitude practice slip away, enlist the help of somebody else. Your partner can help you remember to practice gratitude by asking you at the end of every day what you are grateful for. It doesn’t even have to be formal, but discussing what you are thankful for with somebody else helps to strengthen that attitude. 7. Tell somebody how much they mean to you. When was the last time you told your partner or your mom how much you appreciate them? If your answer is, “well, they know” then you might want to pick up the phone and tell them. This practice not only makes you feel more grateful, but it helps strengthen your relationships. 8. Put a positive spin on your negative thoughts. 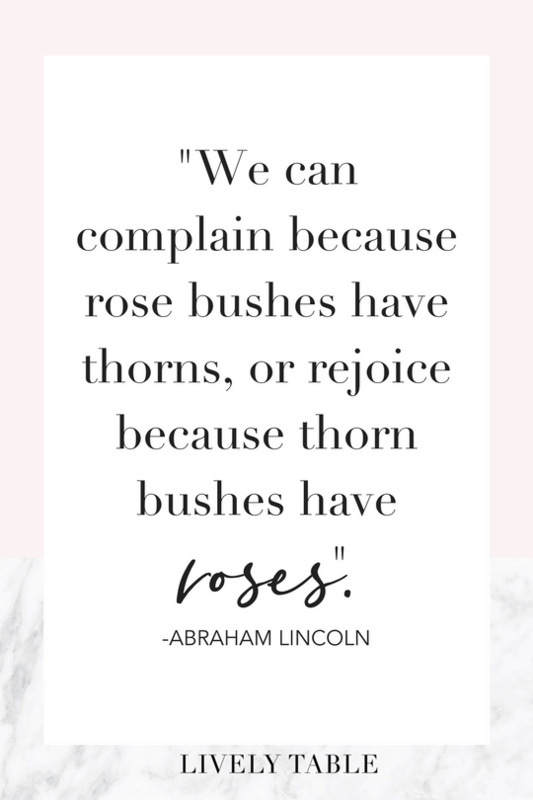 This one can help if you find yourself complaining a lot. When you find yourself thinking negatively often, think of a positive about the same situation. Instead of “Ugh, I hate my job,” try to reframe it into, “I’m grateful that I have a job so I can pay my bills.” This one also works well for body acceptance. Instead of looking in the mirror and criticizing the size your thighs, thank your muscular legs for your ability to walk, run and jump. 9. Feel your joy fully. Finally, when you have a joyous moment, relish in it for all it’s worth, big or small. Let yourself smile, relax and take it all in. Recognize your joy for what it is and allow yourself to lean into it instead of immediately thinking of what could go wrong. It may be uncomfortable at first, but it will make you much stronger and more grateful if and when something bad happens. You can’t prepare for tragedy, but you can be grateful for joyful times. Now let’s practice! Tell me what you’re grateful for today! This is a beautiful, insightful, and helpful post!